I know that on my last post I mentioned that I will not start a new project, until I finished any of my WIP's. But, as you all probably know I am not good at doing that, so I start on a new project. I had been looking for a very simple chain stitch shawl, after browsing on Pinterest and then my books I found one that is so simple and thought why I have never really think of this shawl before. It’s from a ‘vintage’ Japanese crochet pattern book that is no longer being printed ( or sold maybe). 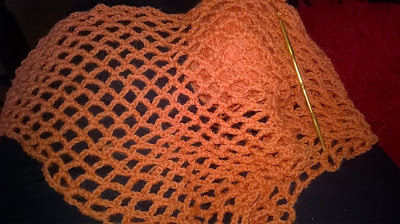 And I started right away with it with the orange wool yarn that was lying around waiting to be turned into something useful and beautiful. Thanks you Nell, it's so grey here at the moment and autumn is coming soon, needs to brighten in up with some flowers to be attached.